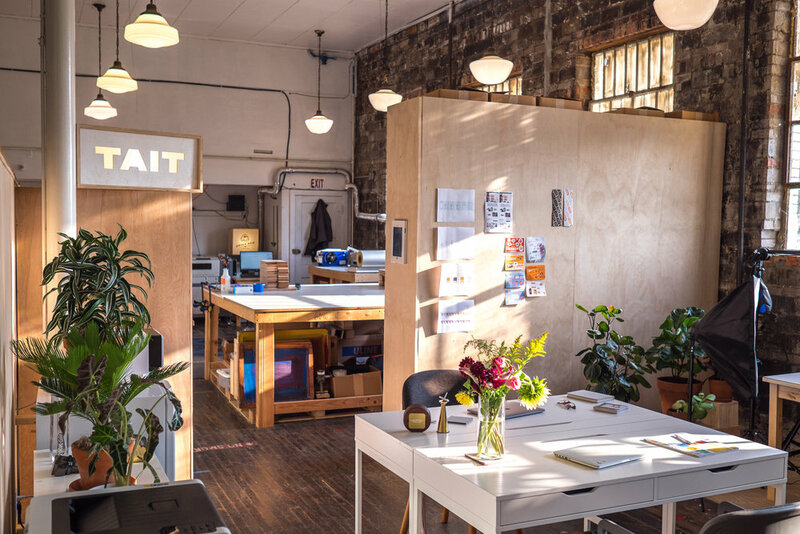 Our Story — TAIT DESIGN CO.
Our sunny studio is located in the Jefferson Chalmers neighborhood of Detroit, MI. TAIT Design Co. is an independent product design studio owned and operated by Matthew Tait and Audrey Elkus. Founded in 2013 in Detroit, we make toys that help people of all ages develop mentally and socially, and homewares that are thoughtful and timeless. We put a premium above all else on the way our products are made, as all of them are designed and assembled in Detroit with 100% materials sourced in the USA. When we go to trade shows in New York, we’re often one of the only companies working this way, but to us it’s important to give those jobs to our community, so our growth positively impacts those around us. Our mission is to create beautiful products that bring people together through a sense of play, impact the local economy through regional manufacturing, and empower the next generation of designers by showcasing Detroit design around the world. Our founder, Matt Tait, went to school to become a graphic designer, but he always had a love for industrial design and engineering. In 2013, he started TAIT Design Co. as a side project while working his day job as an Associate Creative Director in advertising. The first product he designed was the Turbo Flyer – our now classic balsa model airplane kit. He screen printed them in his basement studio at night, assembled each one, and launched them on this site. The Turbo Flyer later went on that year to be featured in a show of the 33 best-designed products of 2013 at the AIGA National Gallery in New York. TAIT Design Co. has come pretty far from the humble beginnings of that basement – winning awards, and having work featured in numerous online and physical publications. In the fall of 2015, Matt left his advertising job with over 8 years of experience to pursue "the side project" full time. Our co-founder, Audrey Elkus, always had a deep fondness for art and design, and grew up surrounded by entrepreneurs. Her family still owns Detroit's oldest family-run men's clothier, and conversations around the dinner table were always business-related. After studying art, computer science and economics at Wellesley College and the ELISAVA School of Art and Design, she returned to Detroit to help grow TAIT Design Co. full-time. She plays a key role in the design and art direction of products, plans short and long term business strategies, and oversees over 250 of our wholesale relationships. While both she and Matt wear many hats, her favorite parts of all of this are bringing new ideas to life, getting to hire art students directly from Wayne State and the College of Creative Studies, and seeing how happy people are when they receive something from TAIT.